Besides “Nobody puts Baby in the corner,” the title of this post is my other favorite line from Dirty Dancing. Lately, I’ve realized that I have made a couple mommy mistakes — mostly to the tune of pushing Maya when she isn’t ready to be pushed. There’s a time and place for everything, to be sure. But I feel like recently I’ve rushed Maya when maybe she didn’t need to be rushed/doesn’t need to be rushed. Maybe it’s just me, but the first year (and surely every year after; just going on my experience thus far as a mom) is chock-full of so many milestones we hope our children will attain: tracking, smiling, batting toys, sitting up, rolling over, eating solids, crawling, cruising, teeth, standing, walking, talking … you name it, and there’s an inherent rush to get to the next milestone. Among mommy friends, it’s one of the most natural topics of discussion: “What’s Baby X up to these days?” It’s never meant to come off as a competitive question, but it’s an inevitable one — and moms want to know their kids are measuring up to their peers. I’ve been 100% guilty of comparing Maya’s growth/development with other kids her age (why am I so worried?! She is FINE!) and following BabyCenter’s emails which talk about milestones … and while some completely make sense, not all have been on par with Maya. For example, she didn’t crawl til 10 months, but she was babbling at 5 months. And she pulled to a stand — including bending down to pick toys up — even before she crawled. And though she is steady on her feet, she isn’t quite ready to walk. She only has two teeth … yet has been experimenting with table food (minimally at first) since she was 6, 7 months old. So we have been all over the board — and that’s totally fine; each child develops on their own timeline–I just need to remember this! Naturally, we ‘ve been encouraging her each step (ha!) of the way … and we have paid close attention to her course of development. We truly haven’t pushed her to anything she hasn’t been legitimately ready for … until the past week. You see, at Maya’s one-year pediatrician visit, her ped recommended starting to get Maya off the paci and bottle now … And while he didn’t give a specific timeline (though he hoped to see her off bottles/paci by her 15 mth checkup) I took it to mean STAT. Luis took it to mean, “starting now …”, as in, easing in, not trying to do too much too soon. So after the appointment we talked and while we knew the bottle wouldn’t happen overnight, we realized we might need to jump-start Operation Ditch Giraffe (her beloved — and only — pacifier — as seen in pics from early December) ASAP. 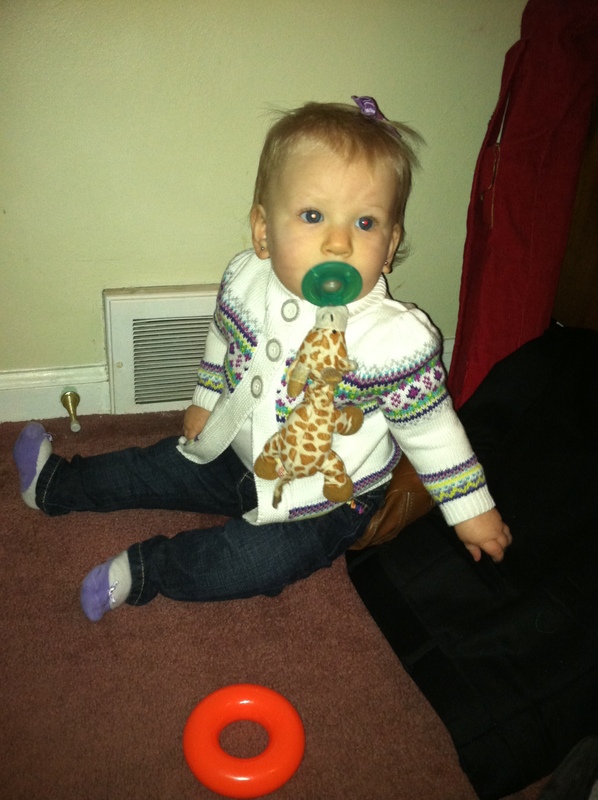 So literally the next night, Giraffe went to paci heaven. I debated just cutting off the Soothie part of Giraffe and letting her have her cuddly little friend, but the more I thought about it, the more I realized going cold turkey in this case would be best (especially since she only has this one paci) — and we’d find her another friend to love. I also figured, because she can’t tell us what she wants, she can’t communicate that she wants/needs Giraffe, in particular. So I stuffed him in a bag and we haven’t looked back. And we’re supposed to be ditching the bottles … but I don’t want to treat one injury and cause another. So we also started drinking from sippy cups–per a friend’s reco — and it has definitely helped … but she still won’t take a sippy cup in the AM for her first milk or last milk of the day. So we will keep trying …. Ultimately, I needed to realize that weaning off the bottles does not mean “ditch all bottles NOW,” and the pediatrician didn’t say that. At babyschool, she is drinking milk at lunch in a sippy–so I tried that the past few days and she has taken a few sips … so long as she eats yogurts and cheese (and she does) and she gets 16 oz of milk a day — which might just initially be from her AM and PM bottles — so be it. But we do need to slowly ditch the bottles … so we will keep working on it. I also realized that there’s nothing wrong with rocking her to sleep still … I mean, sometimes she just goes to sleep — no bottle, no rocking (like tonight) … but I had to get it through my head that it doesn’t make it a “bad night” if I rock her to sleep with her milk — it only takes a few minutes, and she is happier for it. Why deny her (and us) that bonding time? 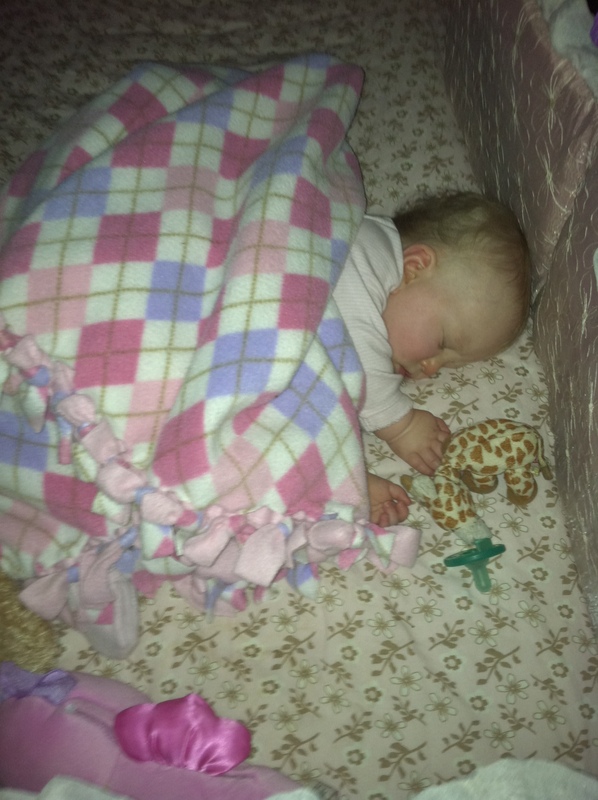 Why was I so eager to have her just go in her crib and fall out like she used to? She still needs us … and I know she won’t want to snuggle us forever. She’s at that stage where separation anxiety is kicking in … and it makes sense her sleep patterns are changing … And once she is asleep, she’s out for a good twelve hours, so it’s not like she’s waking in the middle of the night for us or anything (unless she’s sick, in which case all “rules” go out the window)… so why was I worried?! I guess the bottom line here is, she is still a baby–she just turned a year 11 days ago! And while part of me wants to keep her small forever, I know she will grow up — and there’s no need to rush her before she is ready. Ditching Giraffe outright was probably a good decision … but I think I might have been expecting too much for her to all of a sudden make the switch to cow’s milk, and only have her drink it from sippy cups. For now, we’ll settle for Giraffe being gone and her drinking cow’s milk … from both beverage holders. We’re just going to move ahead at Maya’s pace … taking what the ped says with a grain of salt and use it as a guide — not a Bible — and try not to push her when she doesn’t necessarily need to be pushed. There will be a time and place for that — encouragement is an important part of parenting, for sure. But right now … this is time to enjoy each stage … not blow through them. I’m just sad it took me this long to realize it … And since I can’t look back … I will just look ahead. Onward, 2012!! Edited to add: At babyschool today, a baby in the Infant Room (where the Wobblers go at 4 PM) has the same Giraffe and the teacher (who had been gone a few months but was back today and knew Maya had one) found Maya holding it and loving it before she was told by another teacher that that wasn’t Maya’s … Well, she had already had a tough day with teething pain, and when they took it away, she cried like all hell and was inconsolable for a few minutes til she got a sippy cup of water… which of course made me feel AWFUL knowing how much she loved her pal and apparently did, indeed, recognize him, specifically (as there are lots of pacis at daycare — most of the kids still use them). I know it is the right thing to do to be done with him, but knowing this did make me second-guess myself...I hate that! Why can’t I just trust my instincts? How about you? Was there ever a time when you realized you were pushing your child when they didn’t need to be pushed … or, on the flip-side, where you wish you HAD pushed your child and didn’t? When did you child fully wean off the bottle and/or paci and how long did it take? It takes time…we did it one step at a time. We eliminated the night time feeding first by just skipping it to see what she’d do. She was fine. A few nights later, we gave her a straw cup (she HATES sippies) of milk. She was furious. So we let her have a bottle in the AM, and then only straw cups during the day. When we saw she was drinking from her straw cup regularly, we just swapped out the bottle. Took a few weeks. part of the bottle issue was my own emotional attachment – I loved holding her while she had her bottle! But we both got over it. We got rid of the pacifier a month later, when we realized our nanny wasn’t giving it to her at nap time. TUrned out she didn’t “need” it anymore. It did take her a little longer to go to sleep at night and she woke up earlier every morning, but within a week or two her sleep patterns were back to normal. The bottom line? It takes time and it’s all a matter of patience. Easier sad than done, especially for us type-A girls, right? Thanks honey!! We’re down to four liquid feedings and 2-3 solid meals plus a PM snack. She is taking the bottle for the AM feeding but sippies throughout the day (sometimes when on-the-go a bottle so no fighting!) Most of hers are straw cups but the ones at daycare (toss-n-take) I think are just regular sippies. Aww, I’m with you! I love that snuggle time too — but I’ve found we can (as of now) still have that in the AM/PM sometimes. Glad to hear she is doing great without the bottle and paci. Maya’s been fine without Giraffe–it’s been a few weeks now! 🙂 YES … easier said than done!